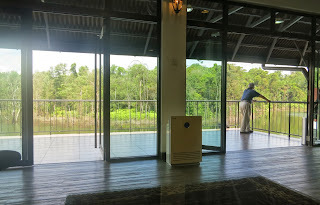 I’m not afraid of the sun but having just returned from abroad where the temperature was much, much cooler, the tropical heat in Johor Baru is truly something to contend with. But when I spot a splash of colour in the sunlight, I forget about the heat and head out of the restaurant for a closer look. 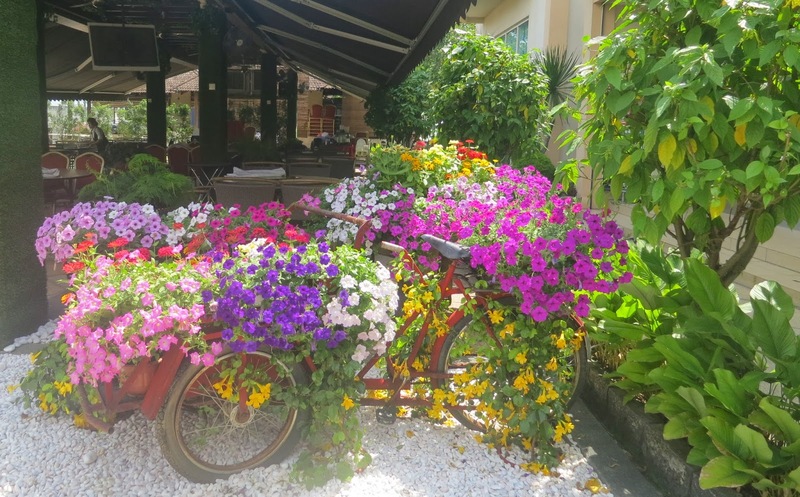 I’m simply drawn to the clusters of bright blooms quite creatively put together in the front yard of the restaurant. 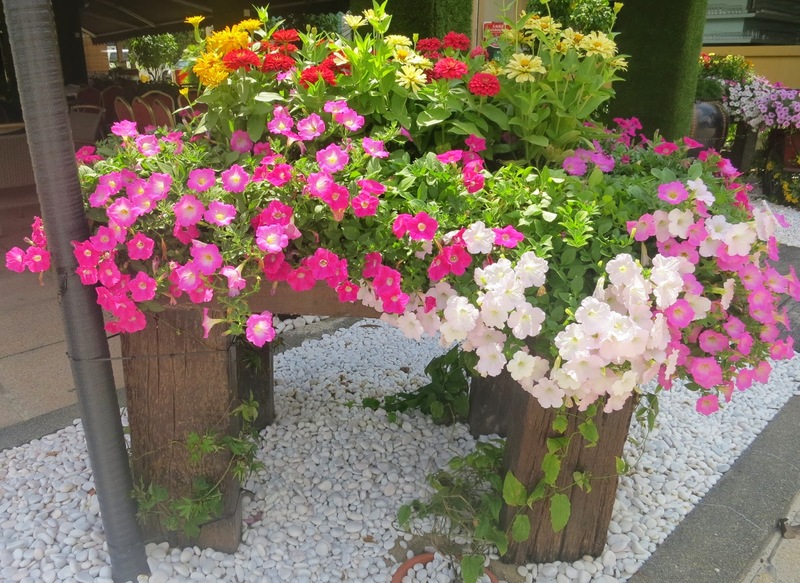 The creeping plants seem quite matured and well tendered, and there’s a charming cottage-feel about the bright blooms waving in the wind and those dainty trumpets reaching out to the sun. When I look closer, I see that the landscape artist chose to give new life to sturdy driftwood and ancient three-wheeler cycles that are almost hidden by the flourishing plants. There is even a tinge of nostalgia in this décor because I have often seen merchants using such three-wheelers to make goods deliveries back in those days when motorcycles or mini-vans were still uncommon. 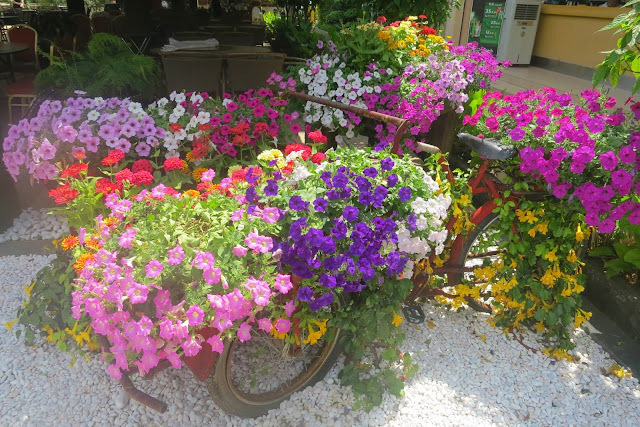 A three-wheeler cycle is hidden under the flowers! The creeping plants are also climbing up the side of the building! What a cheerful and colourful sight! 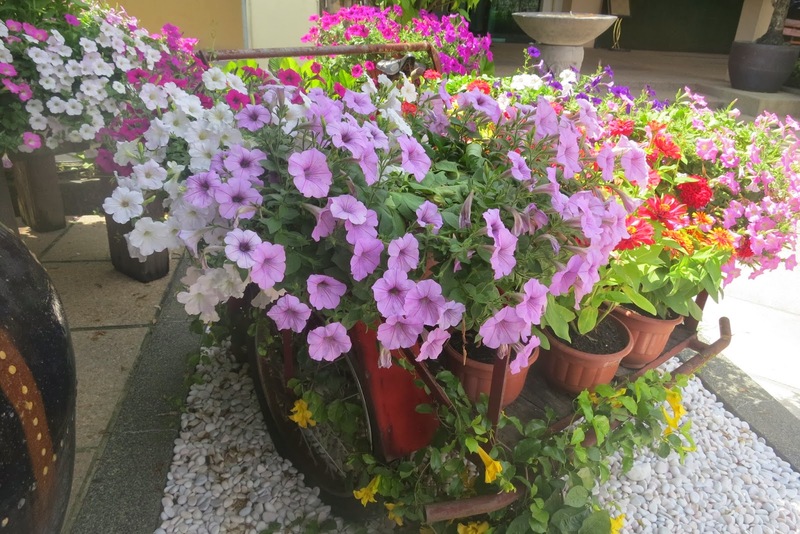 The sight these bright and beautiful flowers is like a breath of fresh air! Can you guess where I saw this? 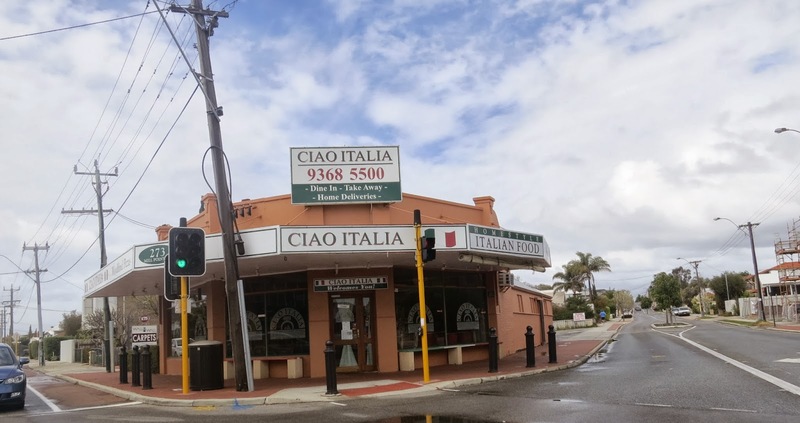 On a visit to Perth, my nephews, Andrew and Aaron, insist that visitors must have The Ciao Italia Experience so we fixed a date to dine there. Now Ciao is a VERY popular place for wood-fired pizza, pasta and Italian specialties and I’m not exaggerating. Dine in or takeaway, the kitchen is always busy and the queue for a table in the cozy restaurant will start to build up from as early as 5.30pm. That’s because Ciao has a policy of not taking any phone-in reservations. I’m told that the queues that clog the pavements outside the restaurant can be rather overwhelming and to avoid being stuck in a long queue, we have a strategy. We decide on an early start that day. After work Andrew and his wife will go directly to the restaurant while Aaron and all of us will meet them there. And when we arrived at Mill Point Road and parked the car, I notice that it is a residential neighbourhood and wonder if the residents are so patient or have gotten used to the crowd that regularly flock to Ciao! only on days when it is closed! Another policy practiced in Ciao is even if you are at the top of the queue but your party is incomplete, you will not be invited inside until every member of your party has arrived. I think this is fair because you may be hogging a table, just waiting for your friends while the restaurant can instead serve other complete groups in the queue. The restaurant aims to serve good food to satisfy their customers and if they could serve a group first, they will systematically go on to serve the next and the next throughout the night and keep everyone happy! The sticker I saw pasted on underside of wooden chair! I observe responsible staff members assigned to oversee the queue and customers familiar with the system, follow in an orderly fashion because I believe all they want is to savour the fantastic food as soon as they can! When we join Andrew at the entrance, I can see through the glass walls that many diners are ahead of us and the restaurant is fast filling up. A staff member is popping out the front door to call for the next in the queue and I’m reassured that Andrew has given his name and our group is ranked somewhere at the front of the queue. Wooden chairs arranged on the pavement are available for waiting groups to rest and more chairs are stacked up nearby. The temperature is fast dropping and rather than sit, I move around to keep warm but I suddenly stop when I read the words on a sticker pasted on the underside of a chair. It read, “Made in Malaysia”… and I’m pleasantly surprised and strangely proud that Ciao customers are sitting on Malaysian made chairs! Maybe this knowledge made me feel a closer affinity to Ciao but I must say that my experience in Ciao can be summarized as simply super! My nephews have warned me about how space is maximized in the restaurant to accommodate up to 90 guests so I’m not surprised with the compact arrangement when our group of eight was shown to our table. Even without ample elbow space, we can sit comfortably. With the buzz in the dining hall plus the excited chatter among staff in the adjoining kitchen and at the wood-fire oven, loud Italian greetings and order-taking going on around us, we can hardly overhear the conversation of customers at the next table seated so close to us. In fact, we can hardly hear ourselves too but it is all part of the Ciao atmosphere in the busy little restaurant! The boys are familiar with the menu so it’s easy to quickly place our order for two portions of Chili Mussels and a range of pasta including their signature Fettuccine Ciao Italia, Spaghetti Bolognese, Spaghetti Marinara and Squid Ink Pasta with Prawns. The meal is not complete without a Ciao wood-fired pizza so we pick the popular Smoked Salmon Pizza. Our orders are quickly served and as the platters are shared around the table, all talking ceased except for requests like, “Please pass the pasta” or “Give me a slice of pizza, please?” We end our meal sweetly with their signature Tiramisu and if it is up to me, I’d like to have a bit more! I look around the restaurant that’s still jam packed with customers literally seated back-to-back and who incidentally, are mainly Asian. After our satisfying meal, we quickly leave [selflessly freeing our table for the next group of diners!] and I can’t help but notice that even among those waiting outside, there are probably only 10% of non-Asians! 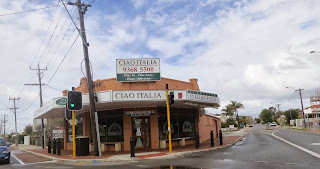 So if you are a fan of good Italian fare and happen to be in Perth, don’t miss the opportunity for your own Ciao experience. Remember – go early or be prepared to wait. A large wood-fired pizza, packed and ready for takeaway! If you are reading my blog regularly, you will notice that since mid October, my original material are now listed under a new category we call, Exclusive. 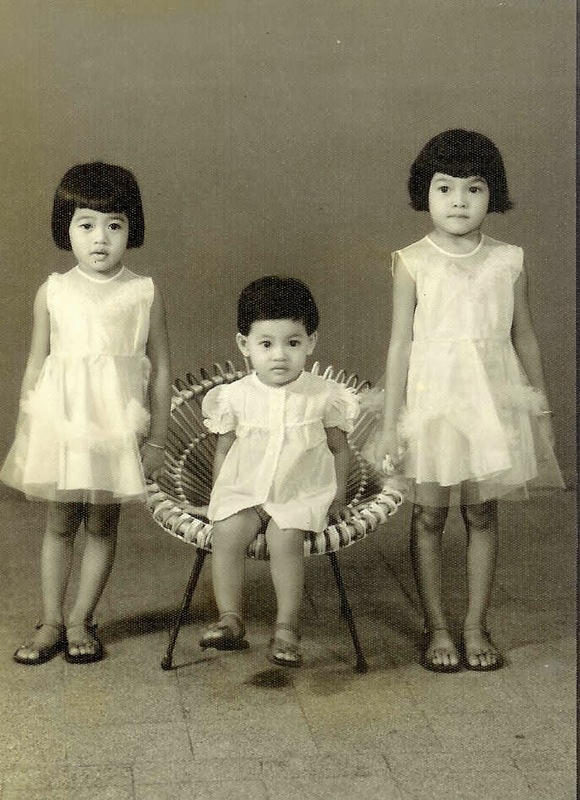 Creating Exclusive will enhance your reading pleasure as it allows you better access to what you want to read in Peggy Loh – My Johor Stories. Now you can go directly to Exclusive for exciting snippets, travel tales, reflections, behind-the-scene photos and other juicy stories that you will not find anywhere but here. A platter of Brussels sprouts with juicy bacon chips, stir-fried by my sister-in-law – Yum! Tidak Halal: My experiences in places that serve pork and alcohol! This is the charming chocolate mud cake my sister’s son and girlfriend made specially for her birthday! [P.S. My eldest sister is a fan of pigs] Check out the fence on the cake made with Kit-Kat chocolate wafer sticks and the tiny piglets drowning in chocolate mud… So cute! Meanwhile, the Memories, Portraits, Journeys, By The Way and Did You Eat? categories in My Johor Stories are regularly updated with my articles that were first published in NST Life & Times Travel and Streets Johor. A comprehensive list of my published pieces can also be viewed in the Recently Published list. Welcome to Exclusive and Happy Reading! If you have ever tasted good Nasi Padang, you will fondly recall the food from Ah Yong Nasi Padang that was synonymous with Nasi Padang in Johor Baru some forty years ago. 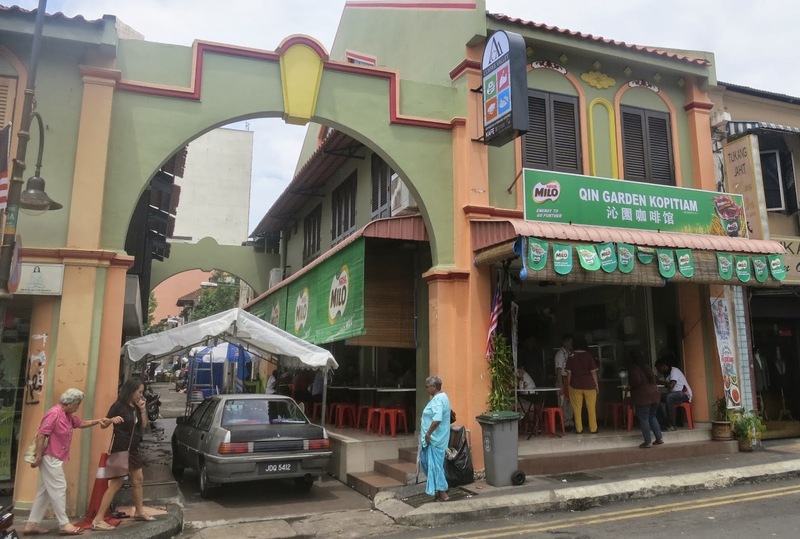 Locals can attest to how this legendary restaurant was the preferred place for a meal of steamed rice eaten with a variety of precooked dishes like beef rendang, vegetables and spicy sambal. 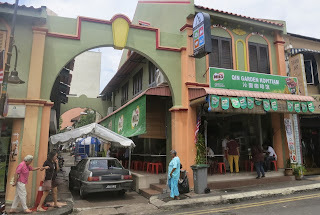 When this restaurant closed, fans of this food were bitterly disappointed but they soon discovered another place for good Nasi Padang at Jalan Trus. 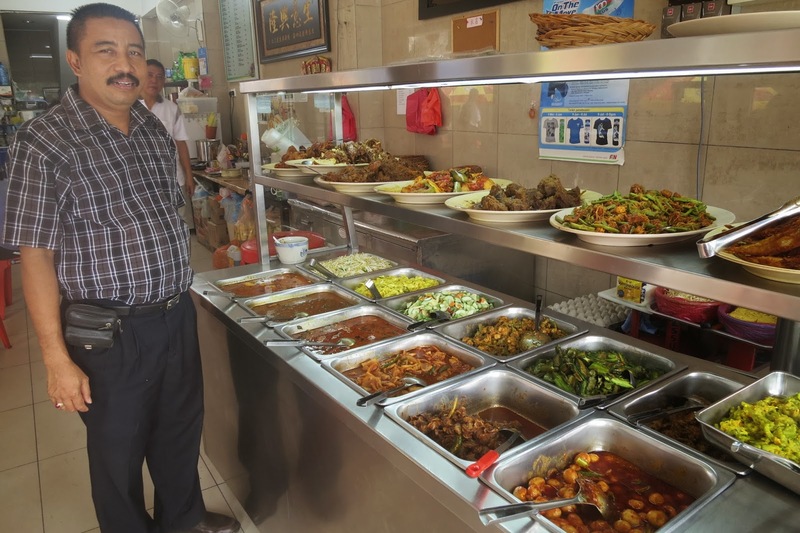 Adam Soroso, 45, serves his Nasi Padang from a coffeeshop at Jalan Trus and customers quickly became his regulars as they simply love his food. Adam who hails from Surabaya, Indonesia, is supported by a team of Indonesian cooks – the same since the first day he started the business about 25 year ago. A few months ago, he moved the business and continues to serve his famous Nasi Padang from Qin Garden Kopitiam, just a stone’s throw away from his previous location. 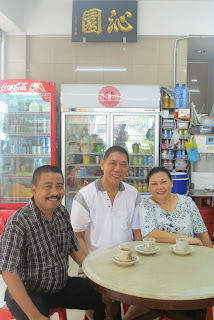 While Qin Garden Kopitiam, run by Tian Wai Ing, 56, and her husband, Lim Choon Thang, 64, opened about 15 months ago, Adam’s partnership with the Tian family who owns their father’s coffeeshop, goes back almost 20 years. When he opened his Nasi Padang stall within their shop, this provided coffeeshop regulars with more meal options for breakfast and lunch. From 7am, the stall will start serving a breakfast menu that includes local favourites like nasi lemak, mee rebus, mee siam, yong tahu and lontong. “Customers can also pick a choice of beef rendang or chicken rendang to go with their breakfast meal,” said Adam, pointing to the chunks of beef stewed in spicy coconut milk and chili gravy. He said that beef rendang, chunks of beef, stewed and simmered until all the flavour is soaked into the meat, is a favourite choice of regulars. Beef and chicken rendang are also popular picks among the richly flavoured dishes prepared to serve for lunch. While tables in this airy corner coffeeshop may be limited, more seating is available under shady umbrellas in the adjacent footpath. The affable Adam is a familiar figure in the coffeeshop as he welcomes customers, shows them to tables and even helps to take their drink orders. So it is not unusual to see Adam shouting the drinks order to the beverage maker at the rear of the shop in the tradition of old coffeeshops! A range of up to 14 freshly cooked dishes are displayed as a veritable buffet in the Nasi Padang for customers to select their choices. From as early as 10.30am, customers come in to buy takeaways or to savour their favourite dishes with steamed rice. Dining is casual as customers are served a portion of steamed white rice on a sheet of greaseproof paper that is placed in a shallow basket and they help themselves to meat, fish and vegetables from the variety of dishes and pay for what they have picked. The menu of dishes may vary from day to day but popular items like the beef and chicken rendang, fish curry, fish assam pedas, fried chicken, thick wedges of egg omelet and vegetable dishes like sohoon tempe, are daily staples. 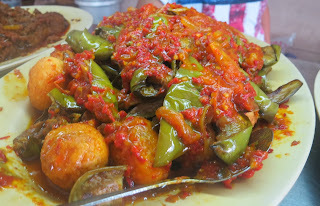 Many regulars say that they head to Adam’s Nasi Padang to seek out their favourite shellfish dishes like cockle sambal and kupang or mussel sambal. Spicy chili hard-boiled egg with eggplant is another hot favourite and if you like an extra zing in your meal, don’t miss adding a dollop of the spicy chili sambal that you will find served in a deep Chinese bowl. Qin Garden Kopitiam is at No. 12, Jalan Trus, Johor Baru. Open daily from 7am to 6pm while the Nasi Padang closes at 5pm. The coffeeshop is closed on alternate Fridays. While dining at Taste Bug’s newest outlet at Bukit Indah, Johor Baru last August, I had the privilege to savour a range of delectable desserts. Like anyone with a sweet tooth, I must confess that the dessert is almost always my most favourite part of the meal. Presented with creativity and a touch of novelty, most desserts today are often too pretty to be cut up and eaten! When I spotted Salted Caramel Ice-cream and Salted Caramel Chocolate Tart in the dessert section of the menu, I had to have a taste because instead of just being sweet, here are desserts that are salted! And when I sampled these interesting desserts, I instantly fell in love with the contrasting sweet and salty taste. But my favourite was the Salted Caramel Chocolate Tart. As the layers of chocolate and salted caramel melted in my mouth, it sent me on a flashback to my childhood days when I used to enjoy chomping into chewy Macintosh toffee! I made a mental note to return for another taste of this delicious Salted Caramel Chocolate Tart and the taste remained firmly lodged in my memory as I’m now a fan of salted caramel. In September, while on a tour of the Swan Valley in Perth, Australia, my friends brought me to the House of Honey and we decided to check out what the café had to offer for afternoon tea. A quick look at the chalk board told us that they were serving Cake with Coffee or Tea. But the cake listed – Salted Caramel Nut Tart – convinced me to stop everything and have tea here. As a true connoisseur of good desserts, I know that there is nothing more disappointing than to be served a dessert that is so small that it is insufficient to satisfy and in a portion or size that does not match its price. At the House of Honey that day, the special was one price for my slice of Salted Caramel Nut Tart and a choice of tea or coffee. Based on the level of my satisfaction, I must say that it was truly a fair deal. A truly fair deal at the House of Honey café for a slice of Salted Caramel Nut Tart with freshly brewed tea! So if you are in the Swan Valley, make it a point to drop by at the café in the House of Honey to see if they have any Salted Caramel Nut Tart for afternoon tea. Trust me, you will not be disappointed! Eye-catching sight of giant cast iron paella pans! At Subiaco Weekend Market in Perth, Australia, there is a collection of food stalls that sell fresh and cooked food. Among the cooked food choices are stalls that serve Spanish paella, French pastries, Indian breads, Italian pasta, Malaysian rice and noodle favourites, and even a halal Malaysia food stall for satay, rendang and briyani rice. While browsing around the food stalls, the first thing that caught my eye at KQ Spanish Food was their giant cast iron pans! With several cast iron pans displayed on their sides in front of the stall, they are a striking showpiece and certainly attracted my attention. And when I stepped closer, I saw similar gigantic pans filled with varieties of paella, generously topped with ingredients – fragrant and ready for delicious takeaways. 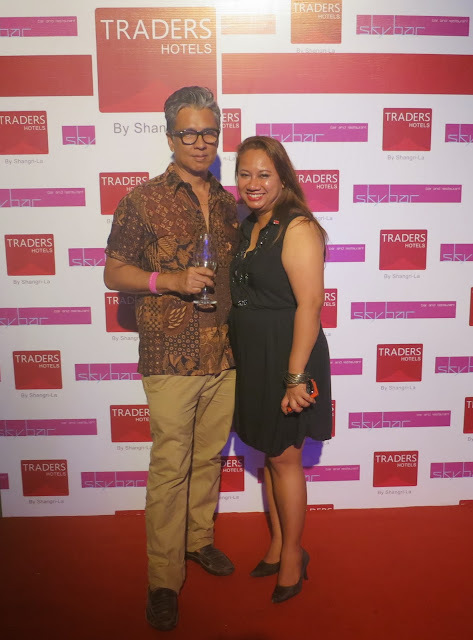 Come meet Kamal Alfaro, a chef with culinary experience in South America and Spain. He now runs K Q Spanish Food, a food outlet that specialises in paella and tapas catering. On that wet and wintry morning at the market, the taste of his flavourful paella was just what I needed to warm my stomach! Drop your extra change in here! 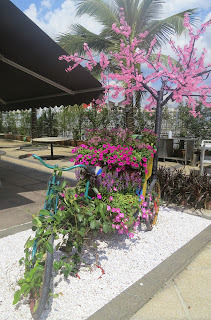 The sight of the giant pans and paella is so eye-catching that they are such a magnet for photography enthusiasts and Kamal has even put out a little bucket which he labeled, Tips for Photos! 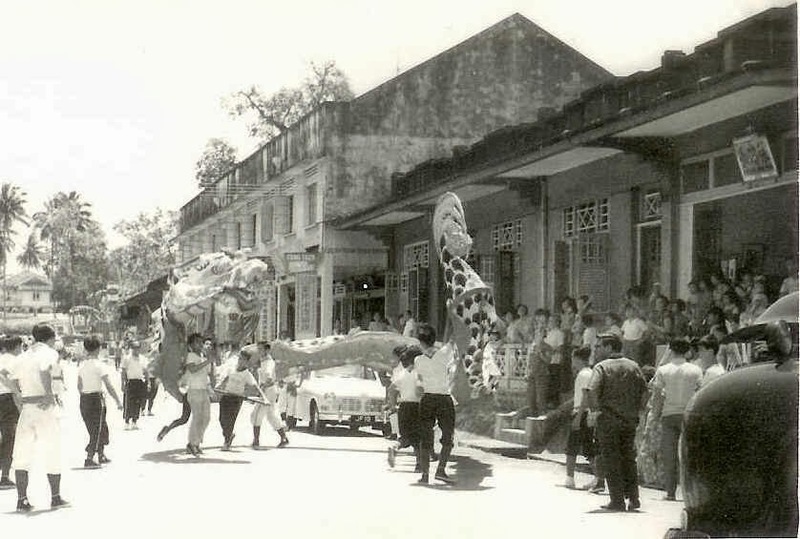 Back in late 1960s to the 1970s there was a coffee shop situated at the corner of Jalan Ngee Heng and Jalan Gereja that was a popular destination not only as a kopitiam for coffee and kaya toast but also for freshly fried kway teow or flat rice noodles from a mobile hawker. There must have been an arrangement between the two entrepreneurs because the fried kway teow hawker clearly complimented the coffee shop business with his fried noodles, served from his stall parked in front of the shop. Every weekend, especially before or after church services, church-goers to the nearby churches would make a stop at this coffee shop for the fragrant noodles. I’m familiar with this kway teow hawker because our grandfather or Ah Kong’s house was at No. 154 Jalan Ngee Heng, just two blocks from this corner coffee shop. This hawker seemed to be an extension of the coffee shop as it was absolutely normal for customers to have a drink in the shop and order noodles from this mobile stall. While I enjoyed the taste of this char kway teow, it was much later that I learned to differentiate his recipe as the Teochew style of stir-fried flat rice noodles. Ingredients for stir-fried kway teow may vary but the Teochew recipe is distinguished by the distinct flavour of thick sweet dark sauce, made from a traditional brew of molasses, sugar and caramel. The noodles also feature ingredients like sliced Chinese sausages or lap cheong, crunchy bean sprouts and another distinguishing item, cockles or see hum. 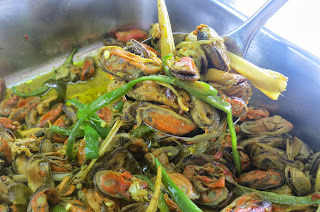 I cannot forget the sight of scalded and shelled cockles that looked red and bloody, ready to be added to the noodles as the final ingredient for a quick stir-fry before the kway teow is dished out and served. I’m told that connoisseurs of fried kway teow in Johor and Singapore have a tradition of ordering a mix of flat rice noodles with yellow noodles because the blend of two noodles tastes better. And yes, one of the ingredients in this hawker’s char kway teow is the liberal use of pork fat in crunchy cubes of lard that added a distinctive flavour to his noodles. 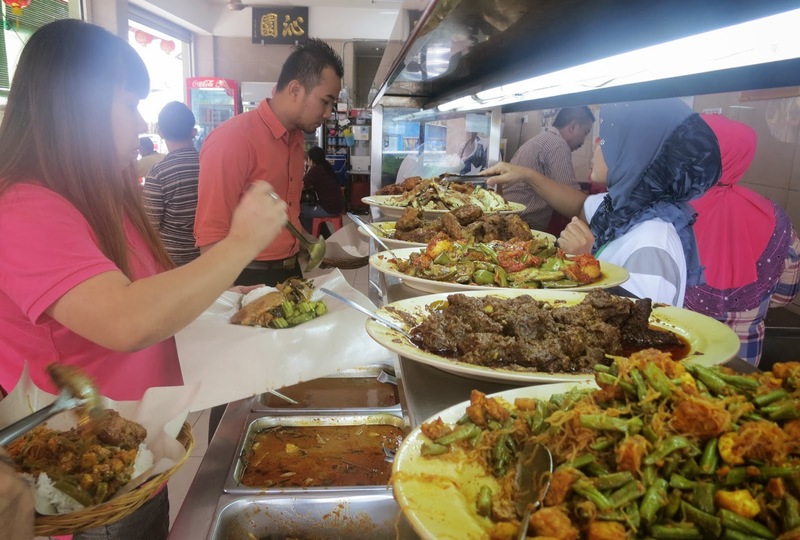 But with the worldwide introduction of char kway teow to food fans, there are now many delicious halal versions that do not use any pork or lard. Since this noodle stall was just a short walk from Ah Kong’s house, my cousins and I were often sent out to tah-pau or buy a takeaway. The hawker was so familiar with us that we could even bring along our own eggs to stir-fry into our order of char kway teow and pay a lower price for it. There was usually a queue to wait for our order but we would be entertained while the hawker put on a big show by deftly wielding the ladle in the wok, cracking the eggs and twirling the sauce bottles with such a flourish not unlike a skilled bartender, that we dubbed him the Action Man! In Johor and other South East Asian countries where street food is readily available at almost all hours, we can pick and choose where and when and what we want to eat. Recently when I was in Perth, Australia, I observed how Malaysians who live abroad long for the authentic taste of freshly cooked hawker fare and this Teochew fried noodles came to mind. When there is limited local street food, the quest for good Malaysian rice and noodle dishes abroad is like a perpetual search for a favourite comfort food! One weekend in Perth, my nephew and his wife took me to Subiaco Market where there is a collection of food stalls that sell fresh and cooked food. Among the cooked food are stalls that serve Spanish paella, French pastries, Indian breads, Italian pasta and even a halal Malaysia food stall for satay, rendang and briyani rice. Our destination, however, was Hawkers Delight, a stall that serves a menu of Malaysian rice and noodle favourites like Ipoh hor fun, Penang prawn noodle, Hainan chicken rice, nasi lemak with a side of sambal as well as fried kway teow. After a glance at the price list, I must admit to spontaneously trying to convert the sums back to Malaysian Ringgit just for comparison. But when we are so far away from our favourite hawker stall in Johor, the desire for that familiar taste outweighed the price and we went ahead to place the order for char kway teow. On that wintry day it took just a few bites of this freshly fried kway teow to conclude that its flavour closely matched the fragrant noodles by our Action Man hawker of Johor Baru, even though we paid A$10 (RM30) for this plate! 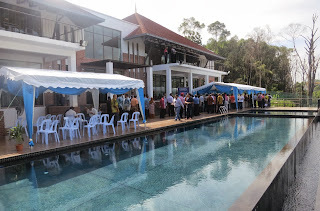 The Johor Cultural and Sports Club (JCSC) marked another milestone in its proud history when Johor Menteri Besar Datuk Seri Mohamed Khaled Nordin officially declared the new clubhouse open in a soft launch event on October 5. 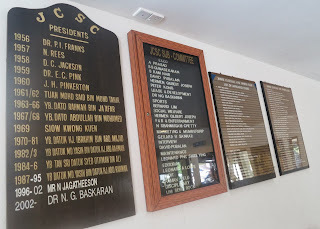 Witnessed by JCSC President Dr N. G. Baskaran, club members and VIP guests, it was a significant start of a new chapter for the historical club as the first phase of the modern clubhouse was opened. At the rebirth of JCSC in its new location, the club remains committed to continue as a multi-cultural club with regular contribution to the community in social, sports and cultural activities. “JCSC has a proud heritage as the first sports club in Johor Baru and the birthplace of the earliest form of the Hash House Harriers (HHH) running club,” said Baskaran, as he reiterated the club’s deep gratitude to the Johor State Government for their generosity and support. He said when JCSC was asked to relocate its clubhouse premises, former Johor Menteri Besar Dato’ Abdul Ghani Othman and State government departments presented the club with a 2-acre piece of land along Jalan Larkin to build the new clubhouse. Earthworks started in late 2011 and despite delays due to inclement weather, construction of the clubhouse was completed by early 2013 in a design by award-winning architects, Y. Architects. 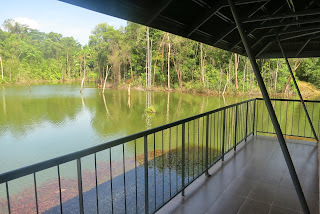 Designed with sports facilities for squash, badminton, tennis, swimming and gymnasium at a cost of RM5.2 million, these will come into operation in stages, starting with the meeting halls, a lounge and café. 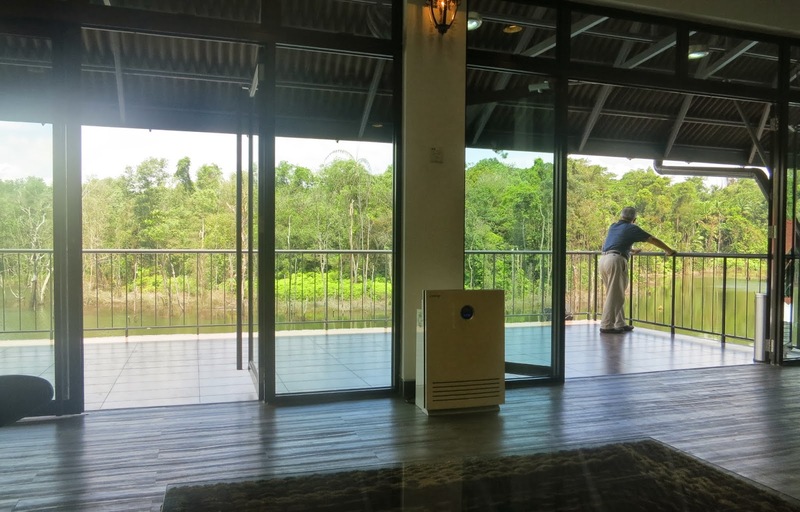 The new clubhouse will be open to members and non-members who can look forward to enjoying facilities in two restaurants, a bar and karaoke lounge, swimming pools and indoor sports activities like table tennis, billiards and darts. There will also be boating facilities and fishing activities in a natural pond located adjacent to the clubhouse. Formed in early 1920, the JCSC was formerly known as the Johore Civil Service Club with members who were mainly British from the upper echelons of the civil service with only a few Malayan senior officers among them. The only non-civil servants allowed to join as members were British and European planters and estate managers. JCSC was then an all-male bastion for sports and social gatherings and was the premier club in the State of Johor up to the late 1960’s. For 81 years, club members enjoyed social gatherings at their clubhouse and various sports like cricket, hockey and rugby in the adjoining playing fields of Sri Gelam sprawled across a 4-acre lot at No. 623 Jalan Kolonel Wilson. With a restaurant that served a Western and local menu and a bar, the clubhouse was once the preferred place to dine and entertain guests. In 1983 this once all-male bastion was open to ladies, allowing families to dine in the restaurant and join social gatherings in the clubhouse. 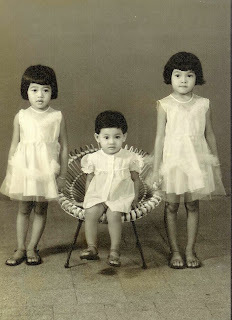 As the member composition of the club gradually evolved with the participation of fewer civil servants, the club was renamed Johor Cultural and Sports Club in 1984. The club was also renowned for tennis as players including student tennis trainees could practice and play on four clay courts, two grass courts and a semi-all-weather court. These games continued until late 1993 when the club’s use of the tennis courts was revoked and Dataran Johor was erected in its place. To build the new clubhouse, Baskaran and club members worked hard to raise more than RM3.5 million to meet construction costs through various fund-raising activities, membership sale and the upgrading of memberships. Baskaran acknowledged the generosity of Tan Sri Muhyiddin Yassin, Deputy Prime Minister and former Johor Menteri Besar, who awarded the club with a RM1 million grant in Dec 2011. He was pleased that the DPM is aware of JCSC’s rich history and its affiliations with almost 100 clubs worldwide including the esteemed Naval & Military Club in London. 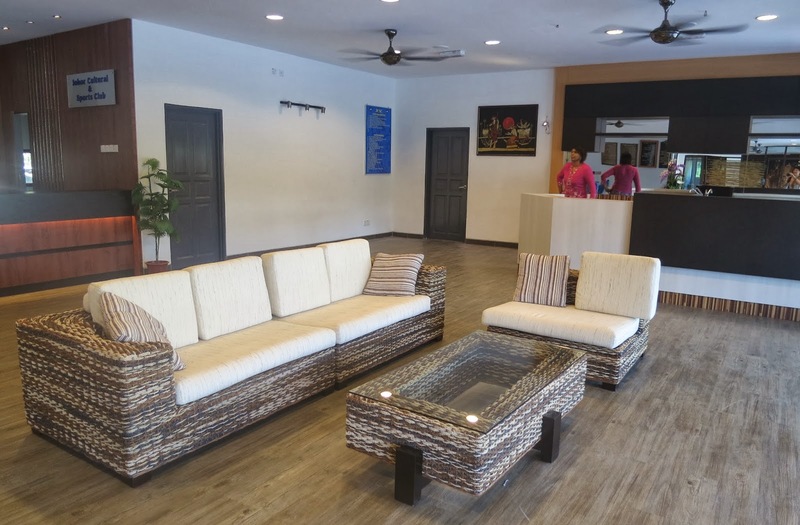 Now with the base structure of the new clubhouse completed, Baskaran appealed for more funds that are required for the clubhouse décor as well as to pay outstanding accounts with the contractor and consultants. 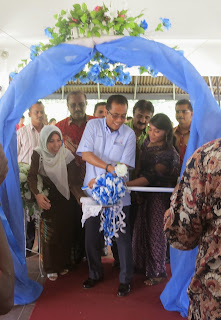 Khaled commended the club for overcoming many difficulties to reach this status in their building project and to help them fulfill their commitment to completing the clubhouse and use its facilities to build up the community he announced that the State Government will provide a grant of RM1 million with half payable this year and the balance in the following year. In a similar spirit of goodwill, the club bestowed honorary memberships to Khaled and the State Exco members with an assurance that a special package will be arranged for civil servants to join the club, enjoy the facilities and revive the glorious days of JCSC. The new JCSC clubhouse is located at Jalan Larkin, adjacent to the Johor Golf & Country Club. For more info and membership enquiries, Tel: 07 – 222 4442 and Fax: 07 – 222 4445. After a satisfying dinner on a cold wintry night in Perth during our recent holiday, someone jokingly asked about what we were going to have for supper. It’s not that we have rubber stomachs that could expand with more space for another meal later in the night but we were just lamenting that Australia is unlike Asian countries where we can find some street food at almost all hours of the day. In Malaysia for instance, we can pop out to the neighbourhood mamak shop for freshly made roti canai, head to the hawker centre for a stir-fried noodle meal of char kway teow or find a stall that served our famous Burger Ramly! At the mention of Ramly burgers, my nephews told us that there is a popular burger place in Perth that opened for late night diners. As is so typical of guys, my nephews did not describe Alfred’s Kitchen in any detail and I had no inkling of what this place is all about – until one day when my sister and I met up with friends for a day’s outing. Sheila and her husband, Mark, showed us some of the attractions in the Swan Valley before we went home to pick their daughter, Sarah, to join us for dinner. We were in fact quite full from indulging in a delightful tea break at the House of Honey where we thoroughly enjoyed generous slices of sumptuous salted caramel nut tart. So when they said that we were going to grab a burger meal at Alfred’s Kitchen, we found the name familiar because my nephews had mentioned this place. Sheila and Mark said it opens from 5pm till late and is a popular hang-out for travelers as well as locals – and if we did not get there early there may be a long queue to wait for our food. Night falls quickly in winter but there were street lamps that lit our way as we walked across a railway track to James Street in the heart of Guildford. I guess Alfred’s Kitchen is probably closest to what we can call a street food restaurant because not only is it situated by a busy road, the meals are served over the counter for takeaways or customers literally just hang around the street to eat it! My eyes were riveted to an open fire burning in a square with people seated around it on benches, some eating while others waited for their orders. A small crowd was already in front of the counter and I guessed they were looking at the menu from a chalk board on a wall, trying to decide what to order. When I saw there were over 40 varieties of burger choices to pick from, it was not surprising that they were taking some time to decide. I quickly picked a Hamburger with Cheese and while Sarah placed our orders, I wandered around to soak in the atmosphere. A chilly wind was blowing but the blazing fire place and the group around the flames and those seated on wooden benches along the wall, created warm company on such a cold night. Among them were families, couples and other groups and those who were already eating around the fire were happily dining alfresco! Opened since 1946, Alfred’s Place is renowned as Perth’s oldest roadside burger kitchen and is literally a hole-in-the-wall where customers received a number after making their orders. Every now and then, I heard numbers being called out in a lady’s raucous voice, probably because they had been serving such a long queue of customers, non-stop throughout the night! The few minutes’ wait passed pleasantly as we chatted and people-watched. Suddenly Sara heard our number being called out so I went along with her to collect our meal that was packed in a brown paper bag. The burgers were wrapped in butcher’s paper with a few letters written in marker pen to indicate its contents. Mine had “HC” for Hamburger with Cheese and when I opened the wrapper and saw the size of my burger, I must confess that I seriously doubted if I could finish it. I was glad that we found seats on a bench because it was quite a feat to hold the burger (within its wrapper) with both hands and attempt to take a bite. The team at Alfred’s had layered the homemade style burger very neatly and I could see the meat patty, cheese and vegetables between the split bun that was liberally sprinkled with sesame seeds. But the burger was so thick that after a few futile tries, I knew that I should only nibble through it rather than risk getting my jaws locked! While Sheila had a steaming bowl of pea and ham soup, my burger was a pretty big portion (even by my standards! ), tasty but not greasy. I have however, tasted better burgers but Alfred’s famous burger has its own merits. Maybe it was our chit-chat, the unique ambience or just chilling out with a casual crowd, but I did not have any difficulty in eating up my entire burger! “Where did it all go?” I wondered (burp!) as I looked at the empty piece of wrapper left in my hands. While Mark washed his meal down with beer, I had a few refreshing sips of orange juice that perfectly complemented my meal. Our used napkins and wrappers were put back into the brown paper bag and we dumped it in a nearby bin as we made our way back to the car. I was amazed that I felt rather comfortable even after putting away such a big burger. Maybe it was the cool weather and the eventful day that helped to work up such an appetite but it was all good. Just like our Burger Ramly, it was a hearty meal of a local comfort food and I’m simply pleased that I had the pleasure of such a unique experience at Alfred’s Kitchen.